The Story of Virgil Glenn Reed and V.G. Reed & Sons, Inc.
His story began two centuries ago, in Putnam County, Missouri. Born August 7, 1893, young Reed displayed an early fascination for printing. Although his father owned and operated a gristmill in the local community, the son could often be found in a local print shop, “The Putnam County Journal”. At first considered a nuisance, his persistence (a trait manifesting itself repeatedly throughout his life) eventually paid off when, at the ripe old age of ten, he was hired as a “printer’s devil”. Eleven years later, on August 12, 1914, V.G. married the beautiful Roberta H. Johnson, his mate for life. The young couple moved to Kirksville, Missouri the following year, where he again made his living in a local print shop. In 1917, the couple moved to Cincinnati, Iowa, where they bought a daily newspaper, The Cincinnati Review, which they operated for seven years. Exactly where they received the capital to begin this venture is unknown; however, being a man of strong Christian principles, there is little doubt that V.G. obtained his start-up funds in a most honorable and Christian manner (more along this line as we get to the beginnings of V.G. Reed & Sons). In 1924, V.G. bought a weekly newspaper in Centerville, Iowa. By this time, Reed was a dedicated Sunday school teacher, on his way to becoming an Ordained Baptist Minister, who had begun attacking the local moonshiners and bootleggers. He wrote strong editorials featuring pictures of insects and small animals, including rats, which had been inadvertently included in the moonshiner’s “recipes”. Certainly these were courageous actions, but equally certain, they were dangerous things to do in a country less than 40 years removed from the wild, wild west. As the story goes, V.G. was warned several times to find other subject matter for his editorials; however, having the Reed “stubborn streak”, he persisted…. (there’s that word again) to the extent that he received a severe pistol whipping in the front yard of his home, with Roberta and their four small sons looking on from the front porch. Having survived this rather stern warning, and with discretion being the better part of valor (and the safety of his family at stake), V.G. abandoned the newspaper, uprooted the family, and headed the Pierce Arrow toward Florida. By this time he was an accomplished printer and a talented writer (it runs in the family) who knew he would have no trouble finding work, even in the difficult depression years. Unfortunately for his plans, the money ran out in New Albany, Indiana, so Reed was forced to stop the odyssey long enough to earn enough to continue, which he fully intended to do. But a strange thing happened. After finding a job, and working in the Louisville area for a while, the desire for Florida vanished and the Reed family was firmly established. V.G., Roberta and their four sons, Max, Ronald, Howard, and Glenn, Jr. chose Louisville as their adopted home. Starting your own business takes courage, confidence and money, and V.G. had an abundance of the first two. However, it was 1938, and the Reed’s lived in a rented home with a half basement (15’ x 15’) at 1691 Indiana Avenue, and the third item was in short supply indeed. By this time Reed was an ordained Baptist minister, so the more nefarious methods of raising capital were outside his narrowly defined set of Christian values. However, being both persistent (that word) and resourceful, V.G. determined where there was a will there was a way….so…. he managed to mortgage the family’s furniture with a local finance company for about $250.00. In the meantime, second son Ronald, who also had been working as a printer, was saving to buy a motorcycle; however, after some serious conversation with his dad, Ronald decided to contribute his $250.00 to the start of the business, very possibly saving his own life in the process. So, with $500.00, in the half basement of a rented home, V.G. Reed & Sons was born. Business volume that year, 1938, was about $2,000.00. The following year, with volume steadily growing, the Reed’s bought a home at 603 Maylawn Avenue, moving the business into its “spacious” 900 sq. ft. basement. The garage was used for storing paper. The years of World War ll brought special challenges to the young business, just as they did to our nation. With three sons in the armed forces, and the fourth working in a defense plant, V.G. and Roberta carried on alone. Son Howard, a Sergeant in the Army, and leader of a machine gun squad, was killed in action on July 28, 1944 in the vicinity of St. Lo, France. These were tough times for all Americans, but we survived as a nation, and through the sacrifice of Howard and countless others, we preserved freedom and the right of individual initiative. And the little business survived! V.G.’s philosophy of re-investing company profits back into the business has been a cornerstone of its operating principals and a key factor in the company’s growth through the years. In 1946 the company purchased a shotgun building at 644 South Shelby Street and, in 1951, the adjacent building at 646 South Shelby was acquired. The next move, in 1968, was to 1500 Arlington Avenue, a 24,000 sq. ft. building at the end of the Butchertown area. That building was expanded by 18,000 sq. ft. in 1985, and outgrown by the mid 90’s. In 1997, the company moved into a 144,000 sq. ft. state-of-the-art building at 1002 South Twelfth Street, its fifth and current location, thereby continuing V.G.’s 1925 commitment to Louisville. In its nearly 75-year history, the company has never been located outside this community. V.G. Reed & Sons enjoys an international clientele. The business is third generation owned and managed, with fourth generation Reeds a part of its workforce. In addition to the Christian principals and moral values V.G. instilled in his company, he shrewdly taught us to seek the difficult. The types of printing other printers tend to avoid. This strategy has placed the company in a market with very little local competition, and has gained V.G. Reed & Sons an enviable national reputation as a business who can do the impossible with the turnaround and quality of high volume printed and bound products, with a focus on print/fulfillment solutions for manufacturers, the financial services industry, and healthcare HMO’s. Many of our clients are Fortune 100 businesses. V.G. Reed, Sr. retired in 1959 (finally realizing the end of the odyssey by moving to St Petersburg, Florida) to allow his sons to use the expertise he had nurtured in them to further expand the business. He was always available for advice, or to lend a helping hand, but confident in the legacy left to his sons, he never interfered in the operation of the company from that point forward. 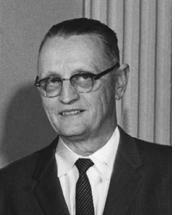 The Reed family and the Louisville business community were deeply saddened when he passed away on April 3, 1967. The responsibilities of leadership have passed from father, to sons, to grandchildren, but no matter the number of generations that come and go, V.G. Reed & Sons always will be a monument to the courage, perseverance, and Christian ethics of V.G. Reed, Sr. V.G. Reed & Sons was his fifth attempt to establish himself in business permanently! P.S. As the story goes, it was a late Fall day in 1948 when V.G. and his Pastor from Eastern Parkway Baptist Church, Brother Puckett, were walking along Main Street near the old Royal Bank when they heard the bank burglar alarm go off, and saw a man fleeing with a bank bag in hand. Determining that discretion was not the better part of valor, guess who chased the robber down, tackled him, and held him until the police arrived!!! You’re right, it was V.G. himself. Never a big man at 5’10’’ and 160 or 165 lbs, V.G. proved that day that within his chest beat the heart of a GIANT! Many folks ask what the "V" and "G" in V.G. Reed stand for and want to know more about these interesting initials. Can you think of some humorous replacements for the "V" and the "G"?